Asian Portal Co., Ltd. has launched “Asian Portal Fishing – Made in Japan Fishing Tackle,” a transnational e-commerce website with over 200,000 items, including Daiwa and Shimano brands, from 300 Japanese manufacturers. We are committed to delivering Japanese fishing tackle to fishing enthusiasts all over the world. Asian Portal Fishing is a mail order website for Japanese fishing tackle. We offer a large number of products to meet fishing needs, including rods and reels from Daiwa and Shimano, made-in-Japan quality lures, and high performance apparel. This mail order website is divided into eight categories: reels, rods, lures, wear, footwear, bags, floats, and other. Each category is set up in a way that users can easily find the product they’re looking for. Popular reels, rods, and lures are published on the top page, allowing users to check what’s currently trending in the Japanese fishing industry. These rankings will be updated on a weekly basis. The manufacturers’ pages contain easy-to-follow summaries about the manufacturers and the types of products that they offer. 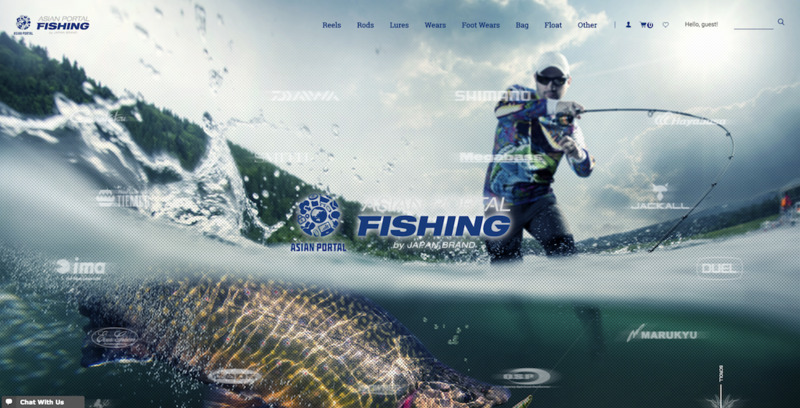 In addition to the Daiwa, Shimano, and Megabass brands, the website features close to 300 other Japanese manufacturers who develop high quality products. We encourage you to take a look at the items that each company proudly recommends. We have over 200,000 items from 300 Japanese manufacturers, ranging from high-end brands that the experts use to cheaper brands with excellent cost-performance. All listed items are new products sold by Japanese fishing tackle manufacturers such as Daiwa, Shimano, Gamakatsu, and Megabass. We have a wide range of products to answer the needs of different fishing scenarios, including black bass, trout, fly, saltwater, and boat fishing. Upon purchasing an item, customers can choose between payment by credit card or PayPal. Ordered items will be safely delivered to the designated address by the Japan Post Service. We provide international shipping at the low price of 5 dollars (with insurance). Delivery takes at least 2 business days. As Japan is an island nation completely surrounded by ocean, fishing has long been a popular leisure activity, and various products have been developed. Popular brands constantly release new models, and over the years, they have developed strong followings. We will continue to introduce new products from various brands on a monthly basis. Compose your email to Kohei Ohtani at ASIAN PORTAL Co.,Ltd.